Don’t get me wrong, I think it’s great that they want our input on the size of a gnoll’s head, dragon hind quarters, owlbear beaks, and goblin pattern baldness, but at what point does this all become a bit much? When D&D goes from sounding like its taking a bold and boisterous new direction and attempting to reclaim its former crown, to sounding like an insecure teenager on prom night, I start to worry. Don’t get me wrong I want them to ask for feedback, but I trust them as creative people and seasoned designers and artists to know where to take certain aspects of their game without asking us. Now don’t get me wrong I’m not writing off D&DNext or jumping to conclusions here, I just want WotC to do their own thing. I’m well aware this is all just preliminary idea gathering and gauging of interest and opinions. Lately I’ve actually gotten a lot of playtesting time in because my wife is now DM’ing for a small group consistently. I also get to see a lot of different sides to the game as a player, which is not only great for feedback but also a nice change of pace for me. The way the game is shaping up both mechanically and (from what little we’ve seen) narratively so far. Mark my words – I am in love with D&DNext, the game, not the wishy-washy questions or the “does this spell ‘feel’ D&D” questionnaires. The idea that everyone has a voice in D&DNext is bold and pragmatic, it sounds noble, like the rally cry from a reborn king. I’m just not sure it’s always as great as it’s cracked up to be. I think everyone has a voice but, I’m not sure all of those voices should carry equal (or any) weight, including my own. Mordankainen, You’ve Probably Never Heard of Him. I’m just worried that some design philosophy or great new idea will get washed away from the game due to entitlement, indecisiveness, the fear of taking even the slightest of gambles, or the nostalgia goggles that could possibly sanitize the whole game into some vanilla, bastardized, inbred retro-clone of itself. I don’t want D&DNext to be LOTRNext or PathfinderNext or ConanNext, I just want it to stand up for itself and say “Hey, this is D&D!”. Then we can all play it (or not) and either love it or hate it and move on with our little gamer lives. Because things like online petitions and nonstop arguing over things like how dragon wings look are the guerrilla tactics and snake oil of the edition wars. Let’s just agree to disagree about petty things and attempt to give the best relevant feedback that we can. Overall, I trust in the designers behind D&DNext, and I trust in WotC to do what’s best for their game in order to make it as approachable and accessible and customizable and all of the other -able’s you can think of. I’m just not sure if I trust the rest of you, or myself. I say let’s move past this phase of silly questions and start asking the more hard hitting ones. Let’s have another giant healing surge or save versus death debate or something, shall we? I whole-heartedly agree! I am NOT a supporter of D&D Next. Not that I think it is a bad system or anything. I just happen to LOVE 4E. And since I’ve invested so much time and money into developing my game table and I think that the 4 years it has had (so far) isn’t enough to dismiss it, I will continue to play 4E at my table. That being said, I have participated in the discussions about various mechanical aspects of D&D Next on the forum boards and also voted in many of the polls. Overall, I like the idea that they seem to be supporting. It seems like they want to make a core game that is highly accessible to both new and old players and then create all kinds of “add-ons” that groups can use or not at their own discretion. And I like to talk about what a Cleric should or should not be able to do. Or a Paladin. Or even what abilities are more “Cleric” or more “Paladin” and so on. I like to talk about the mechanical functionality of this class or that class within the context of an encounter. I also like the discussion about streamlining things like skill checks and combat situations. But there does seem to be a whole lot of “feel good” language about the game going around. As you pointed out, I often hear “Does this FEEL like D&D?” or “Is this what D&D looks like to you?” and I think that is a bit too much. Jerry – It seems to me that you’re talking about a thing that is only somewhat related to another thing. It seems to me that the questions being asked by the actual game design team (the rules makers) are pretty straightforward and responsive to the audience. On the other hand, the art team is a different matter. I think with the recent initiative to make the art in DnDNext more welcoming to a broader audience, the art team is going a little overboard to try and engage their audience with questions it feels might be of interest to them. Some of these might come across as “navel gazing”, but I think it reflects a true desire of the team to make DnDNext something that everyone can look at and say, “that’s my game”. That said, I really don’t think the art articles can really be an indicator of how the rest of DnDNext will turn out. Of course, that’s just my perspective. I agree with you mostly, Randall but I don’t see it as purely just the art, the first playtest feedback survey felt a little silly to me. Probably still relevant, but a little silly. I’m merely using the art as an example here. Regardless of any of it, open playtesting has its pitfalls and I’m starting to see some of them. It all boils down to the fact that I’d rather have a game make a statement, than ask me questions. I think the deal on the art stuff is that they have been working internally on a series of really exciting art projects. If you follow what they have been showing, they seem to have realized that their art is all over the place and decided to pull together more definitive views on monsters, places, peoples so they have a real vision. If it sounds similar to what video games do, that’s probably on purpose – this is really useful for licensing. But beyond that, it likely is very good for them internally on a variety of levels, including energizing the team around visions for settings, for adventures, etc. So, all of that creativity is something they want to share. The sharing is being done as linked articles between the write-up on a race and the write-up on the art. 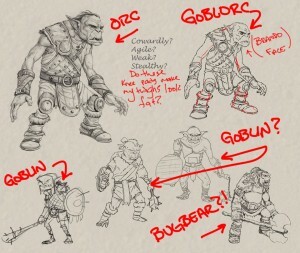 Some of it may seem really common and obvious, but many players out there couldn’t tell you the difference between a bugbear and a hobgoblin (and yet, reading the article, it seems so obvious… that’s the point). On the art side, I think some of it is showing just how complex the art process can be. Maybe that isn’t fascinating to some, but it is to others (for me, being involved in playtesting and editing/development causes me to be interested in other components as well). Yeah, this goblin looks weird to me. But maybe that was the point – to get a reality check from the community when they go with a less obvious take on a monster. For me the ideal goblin is that 3E Monster Manual version – not a comedic take like the Pathfinder ones and not a buff version like the one they showed in the recent article. Also, I don’t want green goblins. Green goblins fight Spiderman. I definitely agree with you on that last part ;). Well, all of it really. I’m not trying to take jabs at the art department here, I really just want them to take a little wider of a stance on some of these things. When it comes down to “please everyone” or “please most” and we’re talking about time involved, I’d rather them just make a statement. (See above reply to Randall). I’m always enthralled by the more artistic aspects of the game, which is why I wrote this post to begin with. I think it is really intersting seeing how all of these pieces start to fit together, I just don’t think my opinion should matter. It’s nice that they ask it, but I don’t think they should take it into legitimate consideration. I’m impatient man, that’s what this all boils down to. Yeah I’m having a blast with pathfinder right now but I want my D&D back in a solid state. It’s selfish of me, but I’m not going to lie to anyone here. I could debate you on goblins all day, but it wouldn’t be much of a debate aside from the fact that I think they should be shades of green, red, and brown. They should also occasional wear pots on their heads. Pathfinder goblins are cute and hilarious, but not the style in which I usually run games. I’m going to sound like a conspirologist, but it seems to me that they just ask minor questions pretending to listen to feedback and make their own decisions for things that are important. I may be wrong – let’s see what playtest 2 looks like. I totally get what your saying. It’s the problem with crowd sourcing. Sure, it’s great to have your opinions and desires voiced, but I want a game designed by the smartest guys in the room, not by the masses. Great post – I think you’ve captured how I’m feeling about all these posts and polls. 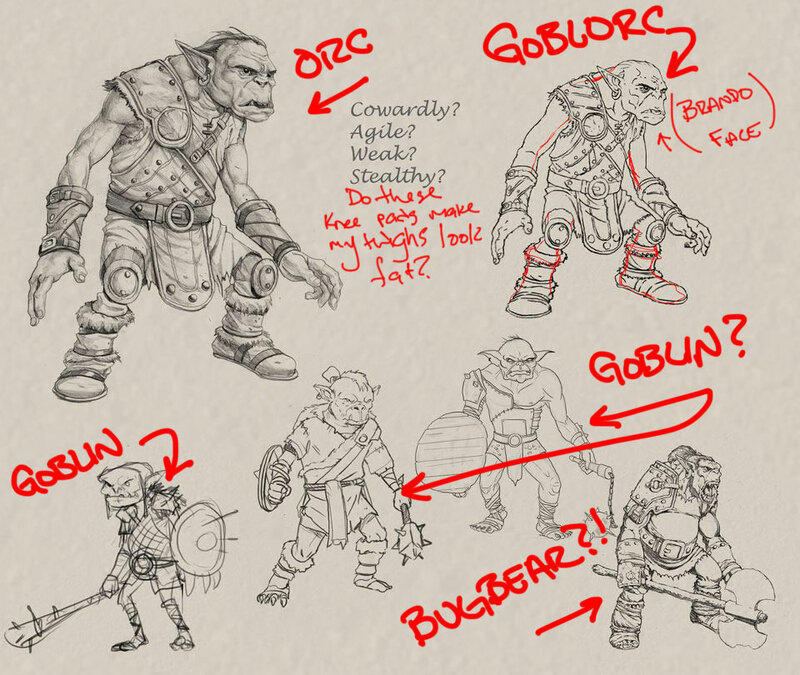 I do like to see concept art though, even if the goblins do look like orcs. Better to allow comments, rather than post polls.